We are proud to offer one of the finest products in gym flooring available in the US. All your concerns have been addressed in creating this state-of-the-art floor. Responsive - Many years of experience and feedback from coaches and tumblers have led us to the optimal materials to produce a floor that is fast and responsive for tumblers of all sizes. Panel thicknesses provide the proper balance for lively, reactive spring engagement. Durable - We use high quality 3/8" (or 9mm) Baltic Birch on both the lower and upper plywood layers. The Baltic Birch is one of the strongest plywoods in the world and provides a much longer life for your floor than a pine plywood or OSB. The wood is the most important variable in the engagement of the springs and therefore the responsiveness of your floor. Easy to install - We have made it so simple to install, you will be amazed at how quickly you can install your floor. 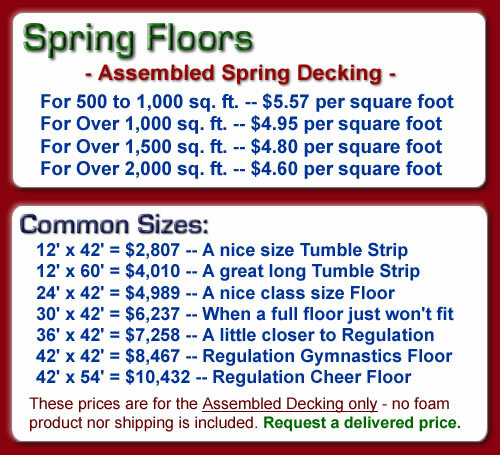 We sell our floors as Mounted Spring Kits, which means that the American Power Springs are already fully mounted to the lower sections of decking and the velcro is already applied to all the panels. All you need to do is lay them down and cover with the foam/carpet product of your choice. 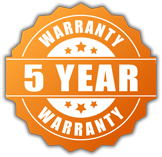 Warranty - The plywood panels are covered by a limited 5-year warranty from warping or breaking under normal use (cheer, gymnastics, martial arts and aerobics). For more detail, go here. Fast Turnaround - We can ship most floors or tumble strips in just a few days. This can vary slightly at peak times, but we consistantly have the quickest lead times in the industry -- without sacrificing great care for quality. Price - Add to this great pricing and the choice is clear! The above portrays the assembly process for a 10' x 10' floor, but the process is the same for all sizes. You would just have more panels. Start in one corner and work toward the opposite corner. > Panels arrive with the American Power Springs already mounted and velcro applied (with staples and adhesive). > The floor comes ready to lay directly into place. > No tools are necessary - well, maybe some snips to cut the bands on the skid. > We use 4" Velcro (not 2") for optimal attachment. > All boards come cut to size, velcroed and well marked for assembly ease. > Your floor is down and ready to perform in just minutes. > We can provide any size of floor (to the nearest whole foot). 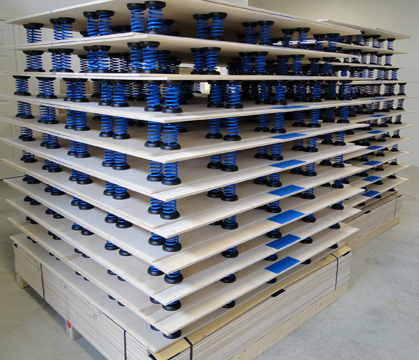 > We custom-make our skids to fit the 5' x 5' board size to assure stability and therefore a more secure transit. We will be glad to provide you with a delivered price for your floor. Just give us the size you need along with your city and zip code and we will calculate your delivered cost. 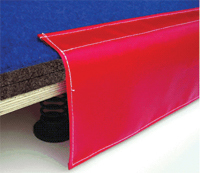 We will be glad to quote the foam, carpet or carpet bonded foam also, if needed. Or just give us a call at 859-881-0018. We are always eager to discuss our floors! Please note: If you are adding to an existing spring floor (and connecting them to each other), you will need to let us know. We would need to know the existing size and the finished size that you desire, to be able to provide a finished contiguous floor. It takes more or larger boards to accomplish this (tying the new and existing together), so it costs somewhat more. There are several products that will enhance the safety and appearance of your floor. Vinyl Floor Skirting is one of the most popular. > You can purchase Vinyl Floor Skirting - here.